Yu-Gi-Oh! 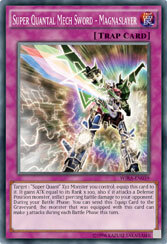 TCG Strategy Articles » Wing Raiders – Maximum Power Xyz Monster Super Quantal Mech King Great Magnus Takes Off! Home > Special, What's New? 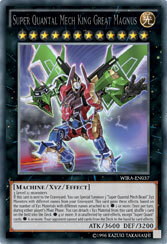 > Wing Raiders – Maximum Power Xyz Monster Super Quantal Mech King Great Magnus Takes Off! Wing Raiders – Maximum Power Xyz Monster Super Quantal Mech King Great Magnus Takes Off! Before you head off to check out the launch of Wing Raiders, we have one more new Xyz Summoning strategy to look at! The Super Quantum theme takes inspiration from one of the all-time great anime traditions: big robots that combine to form giant robots! The Super Quantum strategy aspires to assemble the pilots of the 3 “Super Quantal Mech Beast” Xyz Monsters, get them into their robots, and then combine all 3 robots to form Super Quantal Mech King Great Magnus, a nigh unstoppable 3600 ATK Rank 12 Xyz Monster! Each pilot has two effects to help you assemble the team – one that activates on Summon, and one that activates if the pilot is sent to the Graveyard. The ace pilot of the Super Quantum Team is Super Quantum Red Layer, a Level 5, 2000 ATK FIRE monster with a thirst for justice. You can Special Summon Red Layer from your hand if you control no monsters, and if he’s Normal or Special Summoned, you can pick up another “Super Quant” card from your Graveyard and add it to your hand. When he’s sent to the Graveyard, he Summons back another “Super Quant” monster from the Graveyard with its effects disabled. The genius rookie pilot is Super Quantum Blue Layer, a Level 3 Psychic-Type monster that lets you add a “Super Quant” card from your Deck to your hand when she’s Summoned, except for another Blue Layer. If she’s sent to the Graveyard, you can shuffle up to 3 “Super Quant” cards from your Graveyard back into your Deck, to make sure you never run out! Finally, the wizened tactician, Super Quantum Green Layer lets you field multiple monsters with a single Summon by allowing you to Special Summon a “Super Quant” monster from your hand when he’s Normal or Special Summoned. When sent to the Graveyard, he filters your hand instead, letting you discard a “Super Quant” card to draw a card! 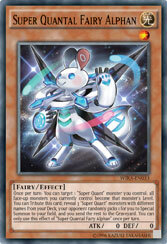 Together, the Super Quantum Team is assisted by Super Quantal Fairy Alphan, who can match the Levels of all your “Super Quant” monsters or be Tributed to randomly Special Summon 1 of 3 “Super Quant” monsters from your Deck, while sending the rest to the Graveyard. This effect is incredibly useful because it allows you to activate effects of all 3 pilots at once! The Super Quantal Mech Beast Xyz Monsters can’t do anything without someone driving them – if they have no Xyz Material, they can’t attack! But they also have 2 Ignition Effects each – one that lets them add more Materials by attaching “Super Quantum” pilots from your hand or field as Xyz Material, and one that lets them mess up your opponent’s field. Super Quantal Mech Beast Magnaliger destroys monsters, Super Quantal Mech Beast Grampulse destroys Spell/Trap Cards,and Super Quantal Mech Beast Aeroboros can flip monsters face-down. All 3 are pretty useful effects, but they become even more useful if you have the right pilot attached to the machine as Xyz Material! If you do, their disruptive Ignition Effect turns into a devastating Quick Effect that you can use during either player’s turn! 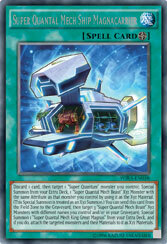 To help facilitate all this Xyz Summoning, you’ll want to use the Super Quantal Mech Ship Magnacarrier Field Spell. It lets you discard a card to target one of your “Super Quantum” pilots and use it as Xyz Material to Special Summon the corresponding “Super Quantal Mech Beast” Xyz Monster from your Extra Deck. Essentially that means you can Xyz Summon with only 1 Material on the field. If you assemble all 3 Super Quantal Mech Beasts on the field, you can then send Magnacarrier to the Graveyard to combine them and all their Xyz Materials as the Xyz Materials to Summon Super Qunatal Mech King Great Magnus! Great Magnus gains abilities depending on how many Xyz Materials are attached to it, so you’ll want to attach as many as you can to the Super Quantal Mech Beasts before they combine. At 2 or more Materials, you can detach 1 during either player’s Main Phase to shuffle any card on the field back into the Deck, without targeting it. At 4 or more, Magnus is totally unaffected by card effects, except “Super Quant” effects. And at 6 or more, your opponent can’t use any card effects to add cards from the Deck to their hand – that includes both drawing and searching! And for the coup de grace, you can take advantage of the fact that your “Super Quant” cards still work on Great Magnus by equipping him with Super Quantal Mech Sword – Magnaslayer – a Trap that gives an Xyz Monster extra ATK to the tune of 100 times its Rank, and can be sent to the Graveyard to let that monster attack 3 times in a single Battle Phase! Super Quantum is one of the most daring Decks ever devised, and you can try it out right now!